$20. each / shipping included. Our embroidered cotton twill baseball hats have a great shape, an adjustable velcro closure, and many color/lettering options. 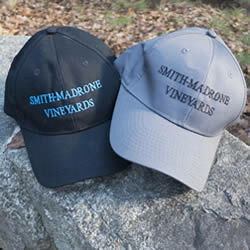 The front reads Smith-Madrone Vineyards and the back reads "Since 1971" Napa Valley. Select your hat and embroidery combo in the shopping cart. We are happy to create mixed orders. Simply select individual bottles of the wines and indicate the quantity in the shopping cart. Be sure to indicate the SHIPPING DESTINATION for each item. Your shipping charges are based on where you will be shipping your wine. You must be over 21 years of age to purchase wines. To order 1-5 bottles, just indicate the quantity in the Shopping Cart. Be sure to indicate the SHIPPING DESTINATION for each item. To protect your wines, we recommend not to ship wine during times of high temperatures of freezing conditions. We are happy to hold your wine for you till the weather changes. Create your own mixed case! 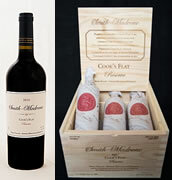 Select individual bottles of the wines and indicate the quantity in the shopping cart. We currently cannot ship wines to the following states: AL, AZ, KY, MS, IL, TX, UT, VT.
** Note: currently we are unable to ship to Texas.